To give you a little more background, I got engaged to my fiance in February (you can read the whole story here), and since my lease was up in May, we decided to move in together. Yay! Except for the whole moving-all-my-stuff part of the process. Lucky for me, he doesn’t live far from where my place was, so every day I’d just bring over a little bit at a time until there was nothing left but the big stuff. Finally, two weekends ago, we got a truck, loaded it up, hauled the big furniture (couch, dresser, etc.) over to his place, unloaded it and breathed a huge sigh of relief. The couch has yet to make it upstairs to where it’s supposed to be (we need some extra muscle from friends to make that happen), but essentially, we’re moved in. And I couldn’t be gladder that we didn’t wait until after the wedding – imagining going through this stress after the wedding and honeymoon is about the biggest downer I can think of. But enough about that for now, let’s talk about the food today: a spicy sausage and rice skillet. 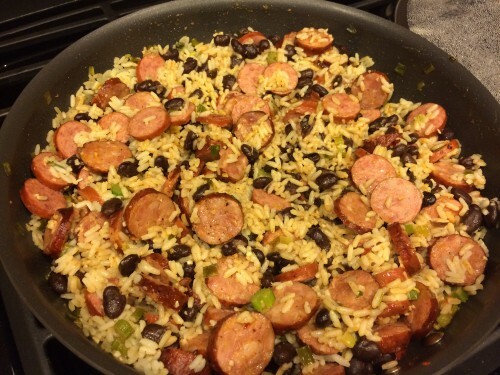 This dish started out as jambalaya but since it lacks some of the key things that I think constitute jambalaya, I’m renaming it as the spicy sausage and rice skillet. It’s quick and easy to make, it reheats well and it’s got spicy sausage in it, what more could you ask for? Slice green onions, chop celery stalks and slice sausages. In a large skillet, heat the oil and cook the green onions, celery and minced garlic until tender, 3 to 4 minutes. Sprinkle with Cajun seasoning and add the sliced sausage to the skillet. Saute for another five minutes. Open, drain and rinse the can of black beans. Stir the rice and black beans into the skillet and saute for another five minutes. Divide into six serving bowls and enjoy. 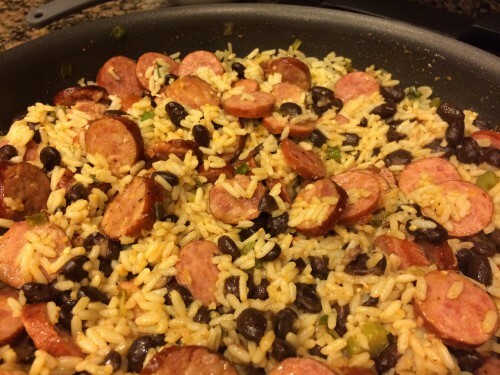 How good does this skillet of spicy sausage and rice look?